By day, Jenna Spencer is a City of Pittsburg employee and the office manager for the Memorial Auditorium. She is responsible for scheduling and organizing numerous special events and performances at the theater, as well as managing and curating the Beverly Corcoran Art Gallery. By night (or away from the office) Spencer is a volunteer and a talented artist. Her latest artwork is a large-scale mural, which is gaining the attention and admiration of downtown visitors. For the past few weeks, Spencer has worked diligently to complete a painting on the Pittsburg Area Chamber of Commerce building, at the corner of 4th and Pine Street. 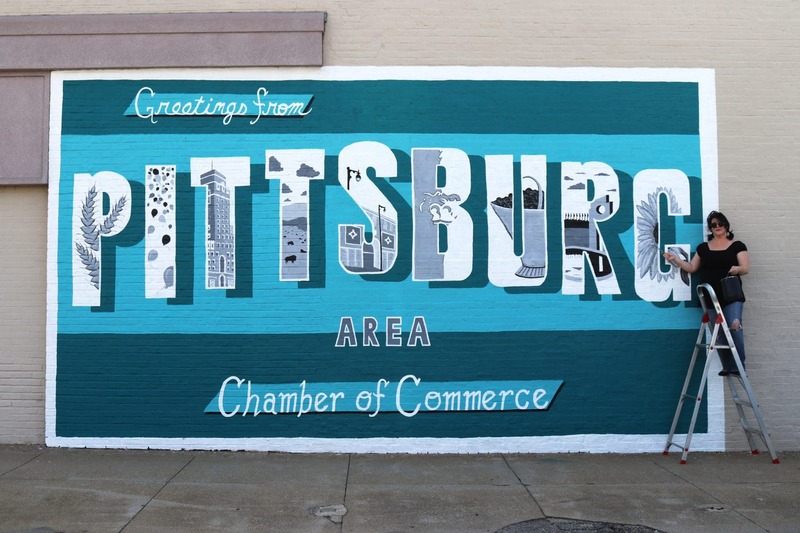 Reminiscent of an old-fashioned postcard, the colorful mural features the words “Greetings from the Pittsburg Area Chamber of Commerce” painted in crisp, white lettering. The word “Pittsburg,” contains illustrations inside each letter, highlighting different characteristics of the southeast Kansas community. Spencer drew inspiration for the chamber’s mural design from iconic images in Pittsburg. The project was made possible through a matching grant from SEK Art Fest, an organization for which Spencer volunteers. This painting is one of nine murals the art fest announced this year. Pittsburg Area Chamber of Commerce President Blake Benson says he decided to participate in the project after seeing the other murals painted around town. Benson says the mural has given their office some added publicity. Spencer says she appreciates the way community members are reacting to her work. After just a few more final touches, Spencer says she plans to complete the mural this weekend.